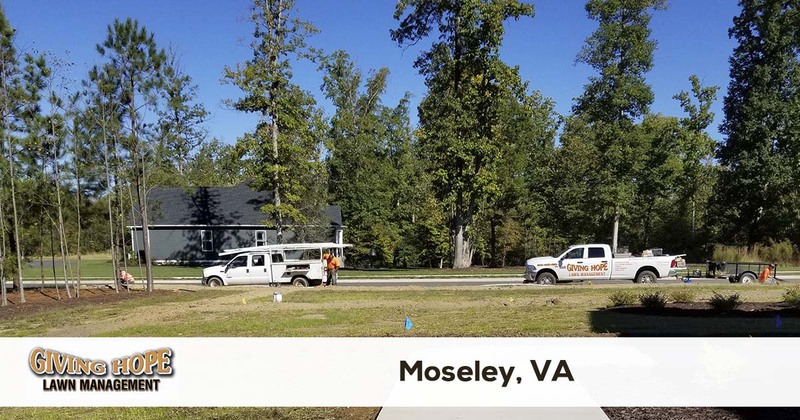 Giving Hope Lawn Management is proud to serve the community of Moseley with professional lawn care and landscaping services. For more information or to get a free quote call us today at 804-839-8340. One of the top things about living in Moseley, VA, is remaining close to the Metro Richmond Zoo. But one item that isn’t as exciting is trying to find a dependable landscaping provider. If you are like most people, you might find the choices in Moseley lawn care often fail to get the greener grass you expect. But before you spend a ton on new irrigation systems or pricey lawnmower units, there’s a more convenient way to save! Giving Hope Lawn Management remains the top choice in affordable landscaping services. We do what others can’t, all at the lowest pricing possible. When other lawn care providers fail to meet your expectations, we offer nothing but the best results each time. Call now and start experiencing your best lawns! Our team has the level of dedication you need for any exterior project. Whether you’re planning a new construction project or can’t find the quality monthly maintenance you need, our company offers it all. Since 2011, we’ve remained the complete landscaping experts for any need. We have affordable solutions for your home lawn care needs, as well as commercial yard maintenance. When you need complete yard care solutions at pricing you can afford, you need our experienced team to service your yards. Call today to save more on the landscaping you deserve! Our team remains the trusted choice for more area lawns. Don’t call just any landscaping service and make sure you are getting nothing but the best! For the reliable option in complete landscaping solutions, you can always trust us to help you. Call now for the best in comprehensive lawn care services. Giving Hope Lawn Management is the industry leader for lawn care and landscaping in Moseley. We offer a 100% satisfaction guarantee with all of our services, so there is no risk for you to give us a try. Give us a call today for the fastest service at 804-839-8340.